After years of disappointing hatchbacks the 208 marked a return to form for Peugeot. However the days when mainstream Peugeot’s were so good that they could spontaneously set fire to large fields of maize are now a distant memory. 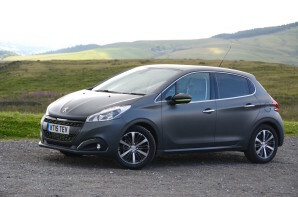 So can the 208 cut it in the most competitive sector of the UK car market? They say that first impressions count, and the 208 starts off on the right foot. It is a good looking car outside with an interior that strikes a very good balance between Gallic flair and usability. We think it is the best looking supermini inside and out. However much of this is do with the decision to position the instrument binnacle above the very small steering wheel which can lead to a few problems. Firstly the instrument binnacle is fixed in position whilst the steering column has ample upward adjustment (good thing) which can mean that some people can’t see the instruments (bad thing). The only way to know if this will affect you is to jump in and find out. The second impact is that the small steering wheel makes the steering feel very quick geared. Depending on your view this can make the 208 ‘nervous’ or ‘responsive’. We would go with responsive and you adjust pretty quickly but it is a clear point of differentiation from other supermini’s so make sure you are comfortable with it. On the move the 208 demonstrates that Peugeot has re-found the art of suspension which provides a very good balance of handling and comfort. It isn’t as sharp as the class leading Fiesta but it is better to drive than the remainder of the pack whilst also offering a comfortable ride making it a great all rounder. The 1.5 litre engine provides adequate go thanks in large to 184 lb ft of torque being on tap and only needing to move 1080 kg of car. It also achieves excellent fuel consumption. The 208 delivers style, comfort and an engaging driver experience. As ever with the 208 a test drive is essential to make sure that you can see the instruments!